By R. K. McGregor Wright, Th.M., Ph.D. This discussion is continued from The Latter Rain Movement - Part 1. But spiritual neutrality does not exist, primarily because the God of the Bible does exist. In the first place, everything that exists is either God himself, or it is part of the creation. There are no intermediate "grades of Being." Then, if an existing entity is part of the creation, it is already interpreted by God as being part of his saving purposes for his people, or it is already interpreted by God as being contrary to those purposes. There is no intermediate state between the Kingdom of God and the Kingdom of Darkness, as if there were some areas of reality that neither God nor Satan took an interest in. This means that everything, including the tricks and techniques of occultism, are already interpreted by God. Nothing is "neutral" as if standing neither for nor against God's own eternal holiness and uncomprehended by his own paradigm of spirituality. Because God's interpretation of all being is exhaustive, everything is meaningful only insofar as it is part of his Plan. This means in particular, that occultic techniques have been developed by the apostate consciousness in its perpetual war against God's Meaning for reality. Paul calls this activity "suppressing the Truth" in Romans 1. Part of its motivation is in order to achieve an alternative or mystical spirituality to the one defined in the Bible. These techniques all gain their meaning, efficacy, and significance, from the purposes or ends they were designed to achieve. They "mean" as tools, exactly what their designers meant them to accomplish. God made carbon atoms to secure organic life on earth. No carbon atom is "neutral" in God's world, for its "meaning" is God's intention for it at any instant. Removed from its context of combination with hydrogen and oxygen in the food chain, it loses its "meaning" as food, and actually passes through us unaltered. In combination with another nearly inert element (nitrogen), it can form the dangerous substance called cyanide. It is not "neutral" precisely because of its design to achieve certain ends. Unless it is interrupted chemically, it will always tend to produce those results, because that is its nature. Likewise, the Zen masters designed the koan, (a proverb or short poem of a humorous or paradoxical nature) to achieve the obliteration of the last vestiges of rationality from the human consciousness on the path to satori, or Zen "enlightenment." When a carbon atom loses its God-given meaning for fruit-eaters by being placed in isolation from its spot in the fructose molecule, it does not cease to be part of God's plan; it still retains its designed properties. Likewise, the Zen koan may lose much of its meaning as a tool of the occult when divorced from its context in Buddhist meditation. But it does not thereby become "neutral." It still has the same properties as poetry or proverb that it was originally designed to have. I have several books of koans in my library, and have read them with much enjoyment, purely as poetry. The Christian appreciates humor and beauty wherever he or she finds them. But it would never do for me to try to use them as helps to spirituality or for Christian meditation, since they were designed for a different end; it would be like trying to use a telescope as a microscope or a hammer as a trowel. None of these things is "neutral" because its nature carries its design with it. Its "meaning" is what its designer meant by it The koan is "good" in a Zen context, only if you agree in the first place that it is "good" to attempt to derail human rationality. In a Christian context it is only good as poetry, as a pointer to beauty, or perhaps as humor. Looked at by a naive westerner and apart from its original function, the koan is reduced to being just an amusing, mystifying joke, or perhaps a beautiful poem. It does not follow however, that it is spiritually neutral," for at any instant it is either being interpreted and used in a Zen or in a Christian context. And ultimately for the Christian, "meaning" is what God intends for anything. Knowing what the Bible says about holiness and about growth in grace, I also know that the Zen koan cannot assist me in Christian meditation, precisely because of its irrationalist properties, and the same goes for any other anti-rational meditation technique not approved by the Bible, whether famous Christians have approved of it or not. It simply will not do to try to smuggle these occult techniques into Christianity via the path of general revelation. Nothing in general revelation is "neutral" either. While all created things "declare the glory of God" in the long run, much of creation is affected now by the results of the Fall. The errors of occultism only tell God's glory in the fact that they are under his condemnation (Deut 18:9-14, Isa 47:12-15, Mark 13:22, Acts 13:6-12; 19:19, Gal 5:20, Eph 6:11-17, 2Thes 1:9-10, 1Tim 4:1, etc.). That is, they are "meaningful" to us because God has already interpreted them in the Bible. The general principle that occult practices are spiritually suspect because of their original purpose and religious use is so clear in the Bible, that one wonders what the motivation could be for trying to get Christians to use them on the grounds that they are somehow "neutral." The notion of spiritual neutrality is incompatible with the Creator-creature distinction, with God's omniscience, and also with the principle of faith Paul enunciates in Romans 14:23, that whatsoever does not originate in saving faith is by default, sin. It also stands in dubious relation with the Reformation principle of sola Scriptura or the Sufficiency of Scripture for faith and life. No human interpretational act is neutral, for our interpretational consciousness is either regenerate or unregenerate. Accordingly, the Bible says that even the heathen's ploughing is sin (Prov 21:2), and so are his sacrifices (Prov 21:27), and his prayers (Isa 1:13), because there is no neutrality in his thoughts (Gen. 6:5, Titus 1:5). "This is an hard saying; who can bear it?" (John 6:60, KJV). The natural heart craves a realm of neutrality to play with, for this is required by the fallen presupposition of the autonomy of theoretical thought. With a realm of neutrality before it, the fallen mind can concretize its assumed freedom, because neutral entities can be safely interpreted any way the observer wants to, with himself as the reference-point, and as if God has not already interpreted it. But as Eric Pement points out in the case of the "Christian" use of occult meditation techniques in the Writings of Richard Poster and Morton Kelsey (among the most popular writers syncretizing Eastern and Western spirituality), they "valiantly [try] to divide Eastern/ occultic methods from their religious foundation, but to no avail" (Pement 1). We should not be surprised that they failed to do the philosophically impossible. Prophecy in the Bible is in the most general sense, simply speaking on behalf of God. It includes "edification, exhortation, and consolation" (1Cor 14:3), as well as predicting the future and transmitting canonical Scripture (14:36-37). Everyone should seek it (14:1 and 39). From the original paradigm case in Exodus 4:10-16, 7:1, we note that the prophet is to interpret reality solely in terms of God's prior interpretation. In the most general terms, he relays God's interpretation of reality to the people of God. Sometimes the prophet gets the word directly from God; but mostly he is simply applying revelation already given. There are only two "grades" of prophecy, true and false. Two tests are given in the Bible for distinguishing true from false cases: the prophet must always speak consistently with existing canonical revelation (Isa 8:20) and he must be 100% accurate in any predictions he might make (Deut 18). Neo-Prophetic Movement Prophets claim that New Testament prophets can he inaccurate, unlike Old Testament prophets (Bob Jones, The Shepherd's Rod). This effectively shields them from having to meet the Bible's standards, which they have no hope of doing, granting their appalling record so far. It's worth noting that most occult foretellers can regularly achieve 80% accuracy (Jean Dixon, for example), and that 50% accuracy would be fairly easy to achieve on an "intelligent guess" basis. This level of accuracy is about as reliable as a handful of Chinese fortune cookies. Most of us have noticed that the trite advice and observations found in fortune cookies are often applicable to those who get them. It would seem by their own testimony, that people like Bob Jones are even less reliable than fortune cookies. There are compelling reasons why God insists on 100% accuracy in his prophets; and we note in passing that Elijah thought the death penalty was an appropriate response to anything less (1Kings 18:40). In the meantime, neither Bob Jones nor Paul Cain have managed to call down fire from heaven, or outrun a horse-drawn chariot (1Kings 18:45-46). As someone said in another context, "When I see I will believe." First Generation Latter-Rainers are few and far between these days. Oral Roberts, T.L. Osborn and Paul Cain are among them. Cain was associated in ministry with one of the most influential of the original Latter Rain prophets, William Branham. One of them, A.A. Allen, died of whiskey poisoning in the seventies; he was often so drunk that he had to be supported on each side by aides in order to continue his healing meetings. Winston Nunes was the Latter Rain prophet who passed on the "impartation" to John Robert Stevens. Latter Rainers Robert Tilton, Larry Lea and W.V. Grant were recently exposed as fakes by TV investigative reporter Dianne Sawyer. None of the three have challenged the expose in the courts, as the evidence against them is so heavy. Apart from the handful of older survivors, much Latter Rain influence is today filtered down through four or five "generations" of prophetic impartation, being modified as it flows. The continuing influence of occultism from such early figures as Franklin Hall, William Branham, and others equally interesting and bizarre, is getting more attention from researchers now that it is realized that the real unifying factor among the plethora of false teachings in the Neo-Prophetic Movement, the Faith Movement, and such curiosities as the Manifested Sons doctrines, is the continuing influence of the Latter Rain revivals of 1948. Albert Dager, Dave Hunt, and D.R. McConnell, are representative critics who have published recently, all documenting the occult influences on various important individuals. McConnell demonstrates that the views of Kenneth Hagin and his disciple Kenneth Copeland borrowed their ideas from earlier New Thought promoters. But some of these claimed to get them from the spirit world (McConnell, Ch. 2 and Larson on Swedenborg's influence). The widespread appearance among evangelicals in recent years of new types of "spirituality" which have long been known to have their genesis in occultism is an important and disturbing phenomenon. It requires research and explanation, for it exemplifies yet another stage in the long battle between the Biblical worldview and the heathen tendency towards syncretism. The Bible's testimony against the spirit of syncretism is consistent and unrelenting. It starts with the Creator-creature distinction in Gen. 1:1, and develops into Isaiah's repudiation of occult idolatry in his own day. It rests with the antithesis between revealed Truth and human error in Revelation 22:18-19. The New Testament apostles are no less harsh against heretical error than Moses and Elijah were, except that they merely threaten hellfire instead of the death penalty. Passages by Peter, Paul, John and Jude spring to mind, of which Jude's short letter is representative. We live in an age of fearful confusion and ignorance among the godly, largely brought on by our refusal to take Paul's admonition about sound doctrines seriously. This is manifested in the general unwillingness to confront (or even admit the existence of) syncretism in evangelical writers, and impatience with the explicitness of the historic creeds and of Reformation doctrine, coupled with refusal to take notice of the close unity of apologetics and evangelism in the Bible. The absence of sound doctrine is just as significant for the building of Christian culture as is the presence of false doctrine. "a man thinketh in his heart, so is he." As it says on the floor of St. Paul's Cathedral, Wren's masterpiece in London, "If You Seek A Monument, Look Around You." 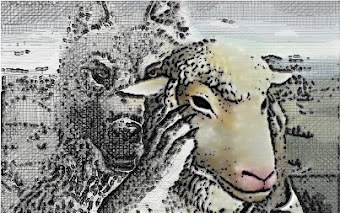 Shepherding: Teaching that the believer can only grow in grace under the authoritative "covering" or spiritual "protection" of an older believer. Leads to heavily hierarchical patterns in churches. Rhema: Synonym in Greek for Logos, but with the narrower meaning of "saying" - the expressed verbal form of an idea, whether written or spoken. Syncretism: The practice of combining elements of various religious systems into one pragmatic framework, especially of non-Christian practices with Christian aims, "baptizing" them in Christian terms. Logos: Synonym in Greek for rhema. Very broadly used term meaning idea, wisdom, word, account, logic, the concept or content of a saying rather than its verbal form. Heresy: An opinion or doctrinal preference tenaciously held and taught, but not compatible with the Bible. Canon: The list of books in the Bible recognized by the Apostles as Scripture, and approved by the early Church as such. Creator-creature distinction: The primary axiom or presupposition of all Biblical revelation, enunciated in Genesis 1:1, that the divine-worldview assumes two levels of existence, and that therefore, Being-as-such does not exist for us to interpret. Some of the Sources Used:Branham, William. Adoption (Taped messages transcribed from May 15, 18, and 22, 1960). Brenneman, Richard J. Deadly Blessing: Faith Healing On Trial (1990). Cain, Paul, and Wimber, John. "A Response To Pastor Ernie Gruen's Controversy with KCF" (Equipping the Saints Magazine, Fall 1990). Dager, Albert J. Vengeance is Ours ; The Church in Dominion (1990). Grubb, Paul N. The End-Time Revival (n.d.). Graham, David. The Doctrine Of Sonship (n.d.). 1) Hamon, Bishop Bill. The Eternal Church (1981). 2) Hamon, Bishop Bill. Prophets and the Prophetic Movement (1990). Hunt, Dave, and McMahon, T. A. The Seduction Of Christianity (1985). Jones, Bob, and Bickle, Mike. The Shepherd's Rod, in 27 pages, and Visions and Revelations, 50 pages. (Transcribed tapes from Fall of 1989). Larson, Martin. New Thought; A Modern Religious Approach (1984). McConnell, D. R. A Different Gospel (1988). Meyer, Donald. The Positive Thinkers (1980). Miura, Isshu, and Sasaki, Ruth Fuller. The Zen Koan (1965). Montgomery, John Warwick. Principalities and Powers (1973). Nichols, Woodrow. Experiment In End Time Apostasy; the Walk of John Robert Stevens (Unpublished SCP research report, 1980). 1) Pement, Eric, and Trott, Jon. "Visualizing and Imaging" (Cornerstone Magazine, Vol. 14, Number 74, 1985). 2) Pement, Eric. "The Walk" (Cornerstone Magazine, in 1982). Randi, James. The Faith Healers (1987). Reid, Virkler, Lame, and Langstaff. Seduction?? A Biblical Response (1986). Wright, R. K. McG. The Unity of Apologetics and Evangelism in the New Testament (1992).